"Seven days from now I will send rain on the earth for forty days and forty nights, and I will wipe from the face of the earth every living creature I have made." In the last article, we'd spent some time taking a closer look at the man that God had decided to use, when it came to representing and preserving the human race. And even though mankind at this point in time, for the second time in its history, had fallen away from God. We were fortunate enough, Noah was able to find favor with the Lord. Through Noah, God was reminded that humanity was still worth saving. And because of this favor that Noah had earned on our behalf, God would use this man to help usher humanity into the new natural world that was soon to come. This "new natural world" that I'm referring to, is a world that would come, after the aftermath of God's wrath had completed. An event that would end up being known as: the Great Flood of Judgement. Now when it comes to the covenant that God is speaking of, when it comes to this passage. Know that it deals with the promise that God had apparently made earlier to Noah. This promise was probably made, at some point between God giving Noah the instructions for the Ark, to a little before the present recorded time, we're now exploring from within God's written Word. Know that Noah had done all of the things that God had commanded him to do. For he was a man of great faith, and demonstrated it, by building the Ark, without having to see one rain cloud, or thunder bolt in the sky. Noah had settled his family and the animals into the Ark, without having to see any signs that a mighty storm was coming. And again, he did all that he did, through faith and obedience towards the Lord. Now some seem to teach that Noah had to be some type of king, who'd perhaps, ordered thousands of men to build the Ark for him. Now I'm mentioning this, because this is a popular viewpoint that is floating around, and you simply need to know about it. But also understand that I do not agree with this assessment, and the only reason why I'm typing it in the first place, deals with the fact that this is what some Bible scholars are now claiming. First: If Noah was a king of some sort, the Sacred Record would have recorded him as a king, like it has done for the rest of the individuals (who were royalty) from within its Sacred Passages. Second: People seem to forget that 120 years had passed, from the time that God had given Noah the blueprints, and from the time it took for him to finish the Ark. 120 years God gave him! Think about that for a moment...? Now I don't know how you feel, when it comes to knowing that it actually took this long. But there's a lot one (along with his family) could do in the time period of 120 years. Third: Why would God allow thousands of laborers to perish in the Great Flood, after they had been obedient to Noah, when it came to the building of the Ark? This would not have happen, they would have been saved too. Be that as it may, the Sacred Record also reveals that this event had happen in the second month, of the seventeenth day, of that month. Which meant that during this time period, the second month would have been November. Now if this was the case, its very important to know that Noah, would have just completed his final harvest for that year. And because of this timing, Noah would have had plenty of food that he could have loaded into the Ark, at the time. Now I don't know about you, but I find this little bit of information to be very convenient, for Noah and his family. Goes to show you that when God does something, He goes all the way, never halfway. Next the Sacred Record informs us that the fountains of the great deep were broken up, and the floodgates of heaven had also open up, and heavy rains started pouring heavy down upon the earth. Understand that the rain came so heavy, and so fast, the clouds could not hold true to the task they were created for. For we find that they were torn open, and completely dispersed by the force of the storms. Now it rained upon, not just part, but the whole entire earth without interruption. Oh, how fatal these forty days and forty nights were, for God had turned the waters that were once so useful, and nourishing towards mankind, into a thunderous plague of punishment that was now working against it. Know that the water levels continued to gradually increase, while in turn, lifting the Ark up along with it. 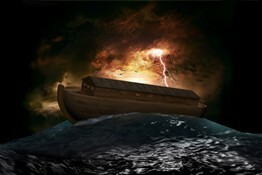 As the water levels rose, so did the Ark, while everything else perished, just like the Lord had warned. For the Sacred Record states that the waters rose so high, all of the mountains that were found to be under the heavens, were covered by at least twenty feet of water. Also know that everything that had nostrils, and breathed, were wiped from the face of the earth. Nothing had survived, outside of Noah and his family, along with the animals that had resided inside the Ark , along with them. The Scared Record also informs us, although it rained for forty days and forty nights, the earth stayed flooded, and the waters did not recede until after 150 days had passed. Now that we've journeyed through this pivotal moment from within humanity's history. We'll move forward and learn exactly what tools (the raven and the dove) and steps, Noah had to take, in order for him and his family, to be able to finally leave the Ark. Added to Page 21: Mankind United As One - Not Good!